The first thing that jumps out at you is the dual rail sole. This is designed to get the club moving through the turf with the smallest amount of turf drag regardless of the lie. The face is very hot. It is made with a thin insert to improve ball speed. And the club comes standard with a very light (65 gram) Fujikura Motore shaft which will increase your clubhead speed. I really like this club, especially for mid to high handicappers. The club is very easy to swing, very forgiving, and the ball jumps off of the face. The rails will help you pick the ball out of the rough. Imagine you are a couple hundred yards out and sitting in some deep rough. Most of you weekend warriors are going to punch back out into the fairway as opposed to going at it with a 3-iron. 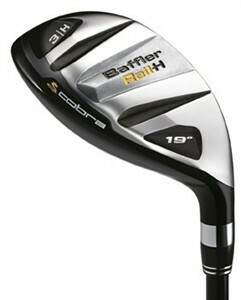 With this club in your arsenal, you will be surprised how easy it is to get the ball out of the rough and flying high. The club comes in 5 lofts. My favorite thing about the club is you can get it in stronger-than-average lofts. Go with the 25 degree or 28 degree.